Walter Frank Pearce and Ernest Albert Pearce are commemorated on a large family headstone. Their parents were the late William Edward and Phoebe Pearce of 22, Chesterman Street, Reading. The 1911 census indicates that Wlater, then 17, was working as a confectionary apprentice. Ernest was a grocers assistant. 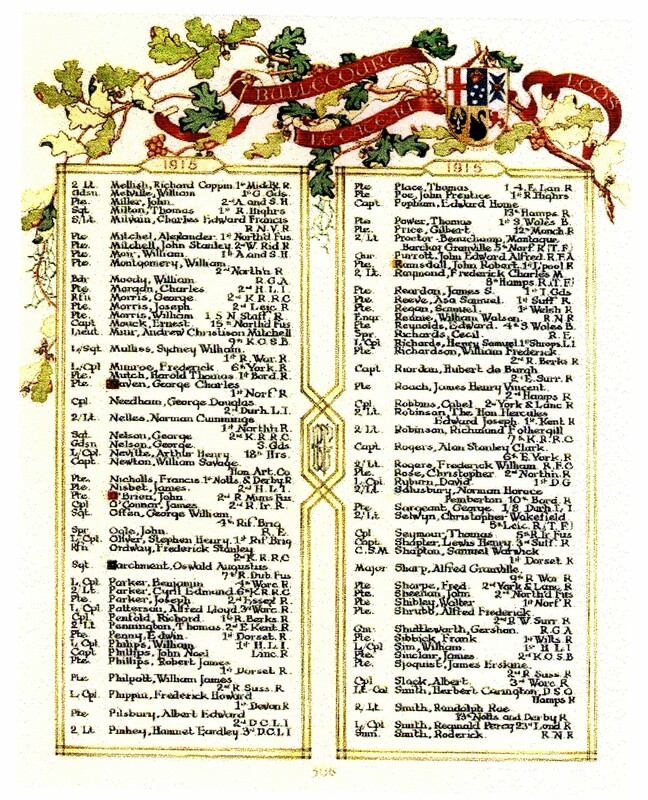 Other family members included William 29 and Charles 19 who were drapery porters; sisters Hilda 22 and Florence 14 no occupation is given for either sister. 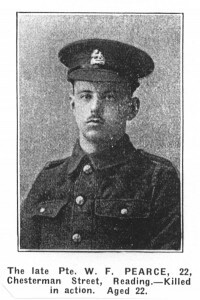 Walter died of wounds at Cambrai as a prisoner of war on 21st September 1916, aged 22. He is buried at Porte de Paris Cemetery, Cambrai. Location I.B.7. Ernest was killed in action at St. Julien on August 16th 1917 aged 27. He was part of a Trench Mortar Battery. The allied forces had on that day attacked along a nine mile front north of the Ypres – Menin Road crossing the Steenbeek River. The ground was torn by the barrage and the low water table made No-Mans Land a morass. All the objectives were captured and the British reached Langemarck and half a mile beyond however, the Germans pressed the British back from the high ground won earlier in the day. Charles Edward Pearce was also injured in the war. 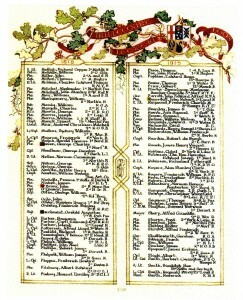 Charles service record indicates that he enlisted in February 1916 and was posted to the Royal Berkshire Regiment. 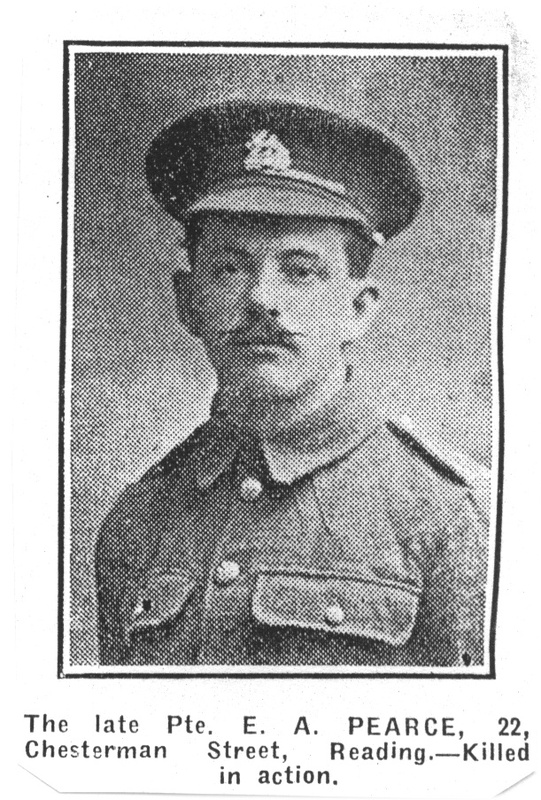 However he was serving with the 7th Warwickshires when he wasinjured. 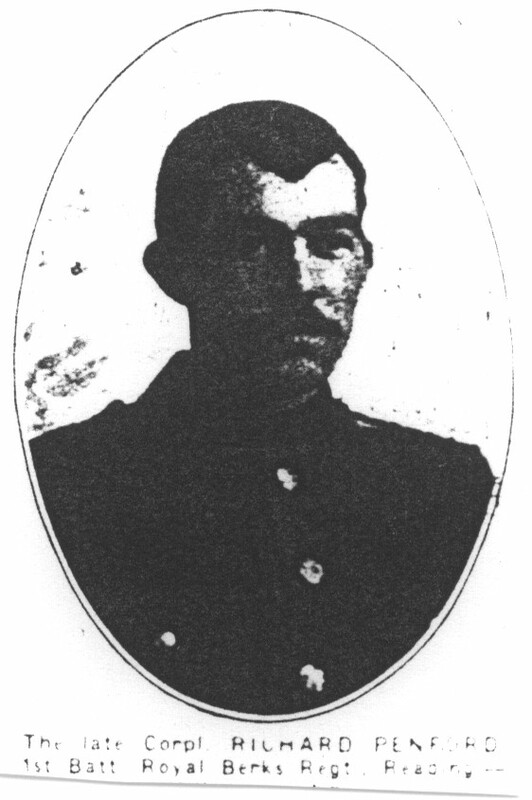 He suffered from trench feet in the winter of 1916 and received gun shot wounds to his neck and chest on 5 December 1917. It is believed that he recoved from these injuries and was able to walk again. He signed his own medal receipt and it is believed that he survived the war. 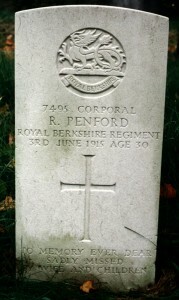 Herbert Pendlebury was the son of Mr Roger and Mrs Mary Anne Pendlebury of 107, Cholmeley Road, Reading and the husband of Ada Mary Pendlebury, of 33, Mill Lane, Reading. Herbert was born in Devises, Wiltshire although his brothers Albert, Walter and Arthur were all born abroad in Cape Colony and India. The 1891 census indicates that Roger was in the armed services as a Colour Sergeant with the Volunteers, the family were then living in Wiltshire. In 1901 he was a labourer at the biscuit factory. 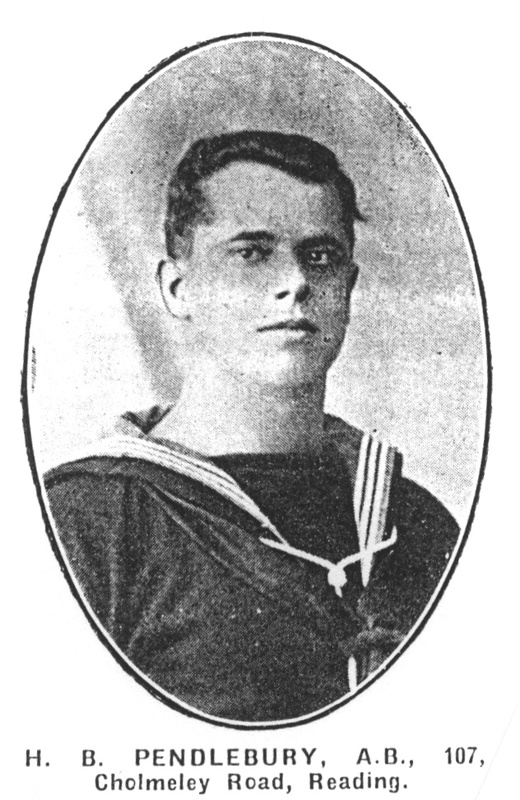 The 1911census indicates that Herbert was serving in the Royal Navy in Asia and China. It is believed that he married in early 1918. His is a registered war grave with a CWGC war pattern headstone. Grave number 12160. 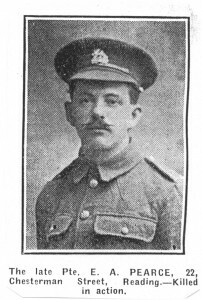 He died 5th March 1919 aged 28. Cause of death is given as dying of disease. Details of his service record are unknown. George Albert Moxey Pratt also served in the HMS Victory and his details are given on this web site. 1st Batt. Royal Berkshire Regt. 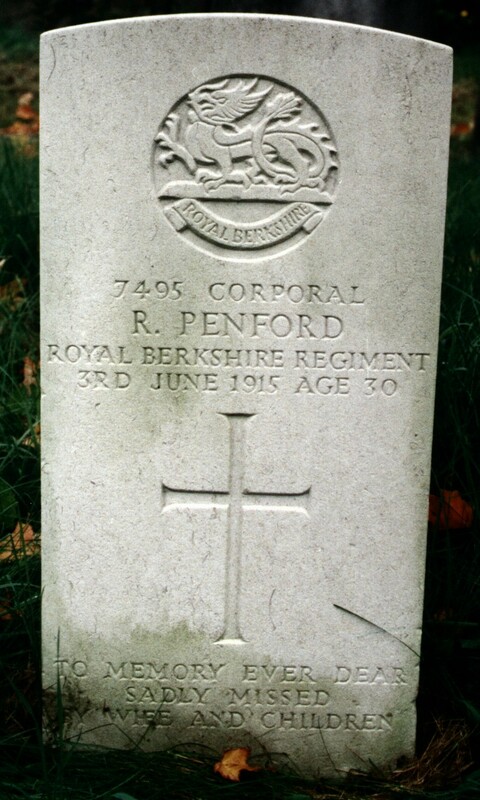 Like most of the Canadians buried in the Reading Cemetery, Corporal Penford, has had his name recorded in the “Books of Remembrance”. It is to be found in the Addendum to the 1915 B.E.F. entries.